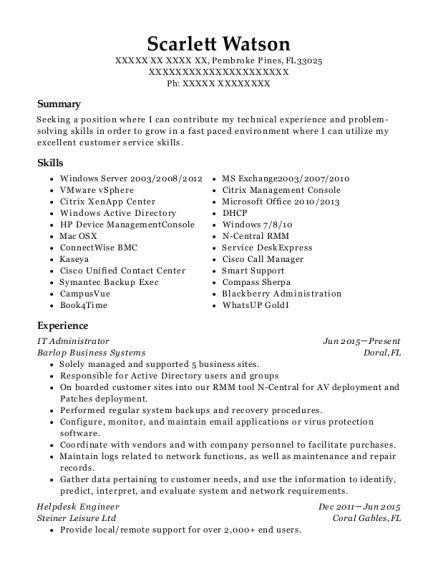 Experienced professional service-oriented Network, Server & Desktop Support Engineer with more than 7+ years of experience in the I.T industry. Core competencies include LAN, WAN, Server and Desktop with excellent communication and time management skills. Handles tasks with accuracy and efficiency with a project management experience. Task oriented, individual or work with team and capable of talking ownership of projects and bringing them to fruition. Networking Technologies: LAN/WAN Architecture, TCP/IP, Frame Relay, VPN, VLAN, VTP, NAT, PAT, STP, PVST. Networking Hardware: Cisco Switches, Cisco Routers, Cisco Firewalls. Routing Protocols: RIP v2, OSPF, IGRP, EIGRP, BGP. Routers: Cisco 2600, 2800, 3600, 3800, 7200, 7600. Switches: Cisco 2900, 2950, 3500, 4500, 5000, 6500. Security Technologies: Cisco ASA, Cisco PIX. Operating System: Windows XP, Vista, 7, 8, 10. Server 2003, 2008, 2008 R2, 2013. Manage, configuration and responsible for Cisco Routers & Switches as well as installation, administration and testing of LAN and WAN network systems, servers, operating system of Routers, Switches, manage cabling and other related network components/equipment in standard with published standards. Provide responses to emergency work requests, troubleshoots network failure, errors and diagnose, isolates and resolves routine to moderately/highly complex network related problem. Assist the Sr. Network Engineer's with developing, monitoring and implementing network security procedures for safeguarding all network systems. Maintain records of completed and in-progress work and updates all the network documentation which include installation, upgrades, configuration file etc. Also manage projects and deliver on time with periodic status reports to management. Manage and coordinate installation of new data services and also provides support relationships with vendor and partners. Interact with other Technology team regarding new application deployments and service installations. Work as a part of network team and managed layer 3 Cisco Switches and Routers with LAN/WAN infrastructure. The LAN consisted of Cisco campus with the model of Cisco 3550 at Access Layer, Cisco 6513 at Distribution and Core Layer. Involved in configuring and implementing of composite network, model consists of Cisco 3800, 7200 & 7600 series Routers and Cisco 2950, 3500, 5000 & 6500 series Switches. Implemented various OSPF scenarios on networks consisting of 7600 series Routers. Configuring F5 load balancer to enabale load sharing and load balancing among web servers. Implemented the use of VLANs and VTP, HSRP and OSPF routing to optimize Layer 2 & Layer 3. Performed maintenance of Routing infrastructure and troubleshooting RIP, EIGRP & OSPF on the network. Worked on FTP, HTTP, DNS, DHCP server in Windows Server-Client environment with resource allocation to desired VLANs of Network. Installed and managed different software on the server to maintain network devices including Hubs, Switches, Routers. Responsible for day to day management of Cisco devices and monitoring of Network traffic. Installed, configured and troubleshoot Cisco Wireless Network, Wireless LAN controllers. Configure and Troubleshoot issues with the following series of Cisco Routers 1700, 2600, 3500, 4500, 6500 and 7200. Configuring, managing and troubleshooting network using routing protocols like RIP v2, EIGRPand OSPF (single and multi area networks). Assisted with troubleshooting all network related issues with routers and switches when necessary and consulted with on call tech as needed for client. Implemented Hot Standby Router Protocol (HSRP) by tuning parameters like preemption. Studied and analyzed client requirements to provide solutions for network design,configuration, administration, and security. Involved in troubleshooting IP addressing issues and updating IOS images on TFTP Server. Performed RIP v2 & OSPF routing protocol administration. Responsible for day to day management of Cisco Devices, traffic management and monitoring. Daily responsibilities included monitoring remote site using network management tools, assisted in design guidance for infrastructure upgrade & help LAN administrator with backbone connection and connectivity issue. Configured & Troubleshooting of Cisco Routers 2600, 2811, 3600, 7200 and Cisco Switches 2950, 3500, 4500, 6500 for LAN and WAN services. Optimized performance of the WAN network consisting of Cisco Switches 3500, 4500, 6500 configuring VLANs. Configured various Routing protocols such as Static Routing and Dynamic Routing including RIP v2, OSPF, EIGRP as per network design need. Configured OSPF on Cisco devices with multiple routing processes and redistributed them.Tested and hands on experience in multi area OSPF topologies. Provided configuration of STP and Port Security on Catalyst 6500 Switches. Monitored and maintained network stability and performance by utilizing various network management tools. Configured Static NAT, Dynamic NAT, Dynamic NAT overloading. Executed BPDU Guard, Port-Fast, Up-link fast and other STP features on various layer 2 and layer 3 switches. Performed all sorts of desktops and laptop troubleshooting for entire systems. Assemble, setup & configure new Desktop PCs, laptops & printers as well as Re-imaging, upgrading, configuring and deployment of Windows 7 operating systems on those Windows XP systems. Image new Dell and HP machines with the installation of different department applications and software. Backup and restore of user's data through windows easy transfer tools (WET), create & compile new user's profile. Join PC on Domain, add new user in Active Directory, reset user domain password, re-map network drives, installation and troubleshoot of network printers, assign local admin rights to users. Daily worked on ticketing system to get tickets of users PC problem, provide the highest level of technical support and troubleshoot user problem in person through onsite as well as through remotely. Trained new I.T staff on Windows 7 Upgrade & Deployment procedure, record incoming inventory of computers & peripherals & match PC asset tag with employee in assets manage software. 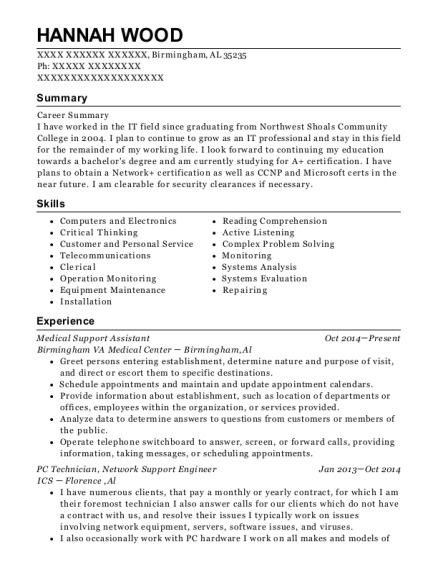 This is a resume for a Network Support Engineer in Spring, Texas with experience working for such companies as Dell Inc and Memorial Herman Health System. 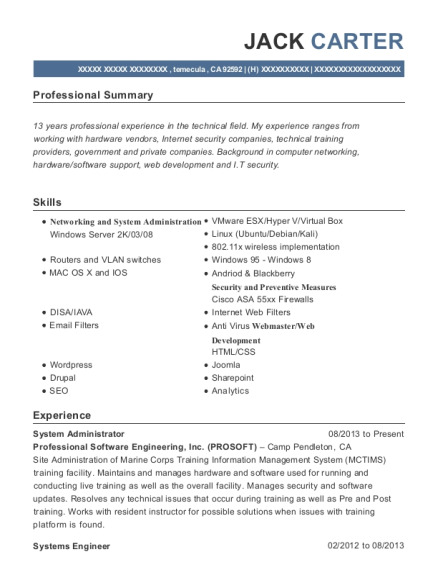 The grade for this resume is 0 and is one of hundreds of Network Support Engineer resumes available on our site for free. 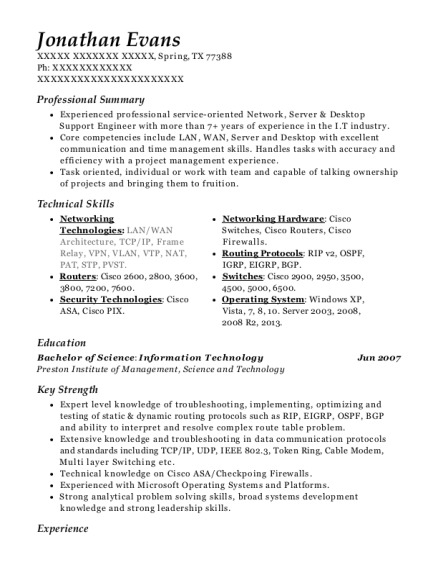 Use these resumes as templates to get help creating the best Network Support Engineer resume.